The rates of 4-week T-bills tumbled in recent weeks, dropping nearly 50 basis points in a matter of four weeks. The investment rate from last week’s auction is 4.683%, equivalent to a 4.79% APY. Even when factoring in the NJ state income tax, the equivalent yield is only at 5.11% APY, falling quite far behind the 5.30% APY I get from IGoBanking. 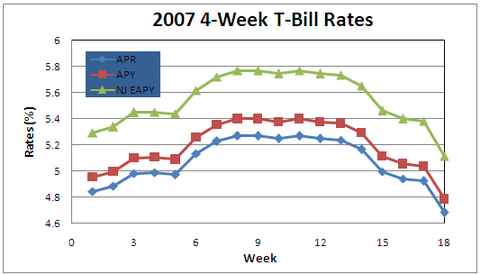 Looking at the historical data of 2007, the rates of 4-week T-bill are showing a bell shape curve. For nearly two months from February to early April, 4-week T-bill beat all the major online banks easily with surperior rates close to 5.8% APY. 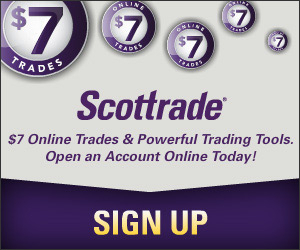 Now the balance has shifted and online savings accounts get the upper hand. Well, I guess that’s one of the problems of investing in T-bills: you never know exactly what you are getting until you actually get it. I need to keep an eye on the T-bill rate in the coming weeks to see where it is going. If it continues the current trend, I will have to reconsider my investments. There is no reason to keep buying the bill even if the rate stablizes at this level. Right now, I am buying $6,000 of T-bills every week. If I do stop the purchase, what I will be facing is finding an alternvative to invest the cash. A 5.30% return is fine, but I feel I can get a little more. One option is to open an account at FNBO Direct bank and lock in the 6.0% APY till September when the $32K I borrowed from Bank of America expeires. However, getting another account is going in the opposite direction in simplifying our finance :((. And I just start to feel that it’s really not that easy to get rid of stuff. Accumuting them? I seem to have no problem doing that. I’m chasing the rates by opening an FNBO account and draining my T-bill ladder into it. We’ll see how T-bill rates are doing again in September! I am considering getting an FNBO account as well. Did you have one already? How long does it take before the account is fully functional?